Order your farm sign today to promote your farm or ranch. 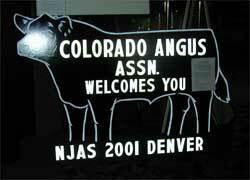 The signs will be hung on the pillars around the showring in Denver at the 2001 NJAS. When the show is over, you can take the sign home. The signs will be made by Schliph Livestock Signs, El Paso, IL, with over 40 years experience. The signs will be 4' by 6' wood with a painted black bull and green or black grass at the base with the wording in another color. On the sign you can put your farm or ranch name, family name, association or business name. If you can't take the sign home with you from Denver we can ship it to you at no extra cost after the show. The signs are perfect outdoors for your farm or ranch entrance or you can use them indoors to hang in your sale barn or office. Signs cost $1,250. Copyright © 2000, 2001 Angus Productions, Inc. All rights reserved.